Rage Fitness is a renowned brand that was discovered in 2008. The brand became quite famous as most of its gym equipment was found in commercial gyms, garages, home gym and fitness clubs present across the world. The reason of its immense popularity is due to its product manufacturing, which is laid upon furious intensity and extravagant force. Just like its name, its products have the intensity to facilitate people who want to make their life better as they run, climb, twist, jump, lift, flip and resist. Though Rage Fitness got widely known in the fitness industry in 2012 due to its originality, functionality and durability. Rage Fitness manufactures many fitness equipment that lay great importance in your workout and daily life. One of the most common and mostly used products are the training barbells. The weight training barbell comes in a pretty limited variety, but are created with high quality and functionality. One of Rage Fitness barbells is their Olympic Training bar. With superior quality and durability, this barbell also comes with great price which made itaccessible to many fitness enthusiasts. 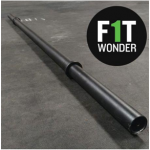 The barbell comes with a great value of tensile strength that is 216,000 PSI. In a weight of only 20 kg, the barbell has the ability to withstand up to 700 pounds of weight. The length of the barbell is 86.5 inches while the diameter is kept very standard and is 28mm. 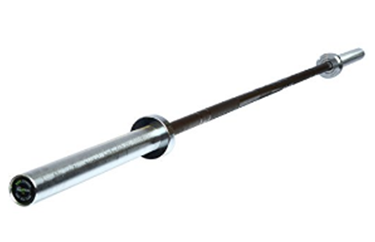 The bar consists of dual knurl marks which are with respect to IPF and IWF standards, whereas no center knurl is provided. With a sturdy steel construction, the shaft of the bar is coated with black manganese phosphate while the sleeves are covered with a chrome finish. This is a bushing bar and very rarely copper bushings are used. 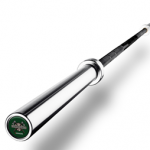 The rage fitness Olympic training barbell is constructed with pure steel having a shaft of black manganese phosphate along with a finish of hard chrome on the sleeves. Phosphate is one of the essential materials to coat the shaft because if its moderate oxidation rate in humid regions and the ability to withstand wear and tear of regular gym abuse. The sleeves of the barbell consist of hard chrome finish that makes the loading and unloading of the weight plates very comfortable and easy. Also, chrome has the ability to bear heavy weight that’s why coatings of shaft and sleeves are not the same. 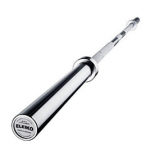 Nowadays, bushing barbells have taken over the bearing barbells because of their good whip and spin rotation that lets you to take your workout experience certainly to a new level. 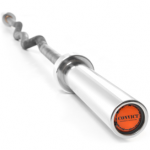 This barbell is perfect for performing curls because of its great rotation and movement due to copper bushings. Copper is very reliable and can withstand wear and tear of regular gym abuse. Copper bushing swith a very careful bushing construction are very rare to find because of their shortage in the fitness market. Copper bushing sare reported to be low priced than bearing barbell, but it is recommended to properly maintain them by applying a light coat of WD-40 or three in one oil. With a massive tensile strength of 216,000 PSI and a bar weight of 20kg, this barbell is perfect for training high intensity heavy workout as this bar can bare weight up to 700 pounds which is immense. However,it’s very surprising for many users to know, that how can a bar having weight of only 20kg can have bear that much of weight, the answer is pretty simple and it is because of its high quality construction and extensive life span. The bar is 86.5 inches long with a diameter of 1.1 inches, thus making the bar pretty standard and ideal for Olympic weight plates. Though there might be a chance of loosening the plates while fitting them in but that factor can also be minimized with the help of spring lock collars. The knurling done on the barbell is a moderate one, making the shaft comfortably fit inyour hands and making your workout experience very secure and stress free. With moderate knurling it doesn’t meant that the barbell will make the texture of your hand rough or is going to do any type of digging on it, the barbell is applicable to workout with bare hands, while starters can use gloves if they want to. The dual knurl marks on the shaft are with respect to IPF and IWF standards which lets you to properly adjust your hands on the barbell. With no center knurl, the barbell may produce difficulties while performing squat. With an exception of that exercise, the barbell fits every Olympic weight lifting exercise which can help you achieve your fitness goals. The barbell comes with a tensile strength of 216,000 PSI. The weight of the barbell is only 20 kg. Has the ability to withstand up to 700 pounds of weight. The length of the barbell is 86.5 inches while the diameter is kept very standard and is 28mm. 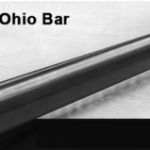 The bar consists of dual knurl marks which are with respect to IPF and IWF standards. Steel is the material used for the construction of this barbell. 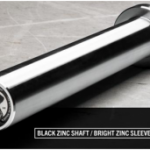 The shaft of the bar is coated with black manganese phosphate while the sleeves are covered with a Chrome finish. This is a bushing bar. 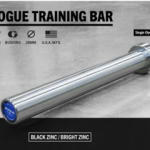 In my opinion, the Olympic training bar by Rage Fitness, is a very standard and good quality barbell, which along with affordability provides the same benefits and specification as a higher priced barbell. The barbell came on my doorsteps within three days in a very hard box packaging which didn’t damage or scratch the barbell. After opening the box, I found that the design and look of the barbell was very eye warming, with that black manganese phosphate coat the barbell looked fresh. I started working out with this barbell and I experienced that the brass bushings are providing a good spin while the whip also moderate. As the weight is increased the spin on the bar is decreases but overall a good and repetitive spin in medium weights. The knurl marks provide a very comfortable grip and it was very easy for me to adjust my hands on the shaft. I really liked the look of the barbell so I decided to properly maintain it to make it long lasting. By light coating with WD-40 I was able to maintain the shiny black design. 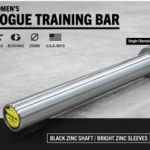 Overall, the Olympic Training Bar by Rage Fitness is a very affordable barbell with simply all the specifications and benefits as an expensive barbell. It is recommended for everyone to use. Perfect for beginners and women who want to do deadlift, curls and more. The bar is very sturdy and can handle weight up to 700 lbs. Dual knurl marks are with respect to certifiedIPF and IWF standards which lets you to properly adjust your grip. Chrome finish on the sleeves lets you to handle maximum weight and making the loading/unloading of weight plates quite easy. Copper bushings are used to provide a good and repetitive spin. The bar doesn’t fit on the standard racks. The black manganese phosphate shaft needs proper maintenance. The bar consists of high tensile strength, means this barbell is not whippy. Warranty isn’t included in the package. Moderate knurling might not be really suitable for experienced weight lifters as they ask for kind of a more aggressive knurl.